bl.uk > Online Gallery Home	> Online exhibitions	> Early photographically illustrated books	> Rievaux Abbey, Helmsley, Yorkshire. William Howitt begins his book 'The Ruined Abbeys of Yorkshire' with a criticism of the “Dryasdust” style of historical writing used by topographers by which one gets “the bare bones of the chief facts, and nothing but the bare bones; no flesh, no muscle, no skin, no beautifying colour and life." He quotes at length from Alexander Pope's 'Moral Essays' which describes the "miserable end" of George Villiers, Duke of Buckingham. On Rievaux Abbey he continues: "The chief remains are those of the transept and the choir, with a portion of the main tower standing at the junction of the transept, and what once was the nave, but of which only the foundation can now be traced. What, in fact, is the present transept, must have been the body of the original church. It bears all the stamp of that early period. Its small, and, for the most part, round-headed windows and rude masonry tell of the Norman period of the days of Walter Espec. The tower is short and broad, like most Norman towers, with its tall narrow lancet windows; but the choir has all the air of a later day. The lofty pillars, its pointed and often deeply-moulded arches, and all its carvings, are of much more advanced style...The side aisles are divided from the centre by eight clustered columns on each side; above is the triforium arcade, consisting of fourteen arches on each side; above which is a passage along both sides of the choir, going past the windows. The brackets of the columns, rising from between the arches of the lower arcade, are adorned with foliage finely carved, yet as fresh as when cut." 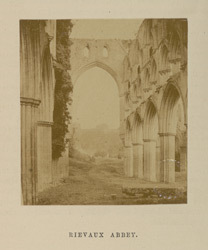 This is the third of four photographs by Russell Sedgfield published in this re-issue of part of 'The Ruined Abbeys and Castles of Great Britain' (1862).